Well, I thought shrimps and prawns were similar..apparently, they are not. Check this out for more information. For this recipe, you can use either depending on where you live and what you can find. 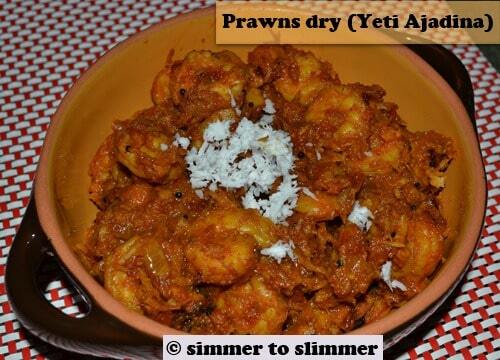 We call it yeti back home in Mangalore and ajadina means dry gravy. This recipe is a concoction of how my mom and my sis in law make it. Whenever my mom used to make this at home, I would go for seconds and thirds till there was nothing left :(. I think it is totally worth hogging over. When I make it I usually pair it with plain rice and yogurt. 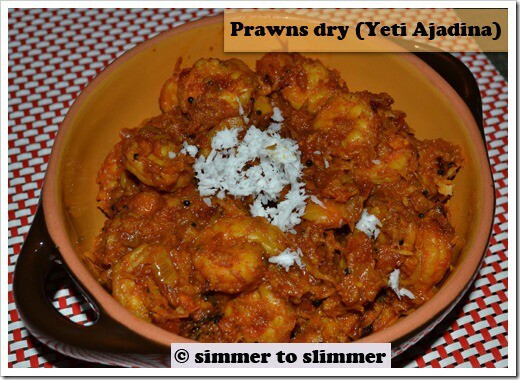 Yeti / Prawns ajadina - This Mangalorean style shrimp side dish is spicy and full of flavor. Pair with rice and any curry to make it a complete meal. Heat the oil in a medium sized pan on medium heat and add mustard seeds to it. When they start spluttering add kadipatta to it. Let it fry for around 20 seconds and then add onions and garlic paste and fry them till they are translucent. Add ground ajwain, pepper powder, and methi seeds and mix well. 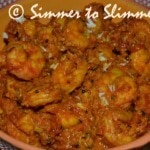 Add the shrimp/prawn along with chili powder, salt, and Mangalorean masala powder and mix well. Then add half a cup of water and let the shrimp cook in it. Add water as needed till the shrimp is done and all there is no more water left. Add grated coconut and mix well. Simmer it for 5 minutes and take it off heat and serve hot. Stay in touch if you can, by dropping in a line whenever you have time. Would definitely be in touch with you. You take care, Shweta. Nice connecting with you. Thank you very much, for all the great recipes you have shared here. Shweta, Mangalore brings out a lot of fond memories for me as well. Glad you enjoyed reading about them. Thanks for stopping by.